On a sunny August morning in 2016, a baby sea otter was found washed up on the sand. Orphaned and sick, Rialto was taken to the Seattle Aquarium, where his dedicated caretakers nursed him back to health and taught him how to be an otter. Soon, the charming Rialto was stealing hearts as he played with toys made of ide, swam in his very own pool, ate tasty clams, and floated on his back. 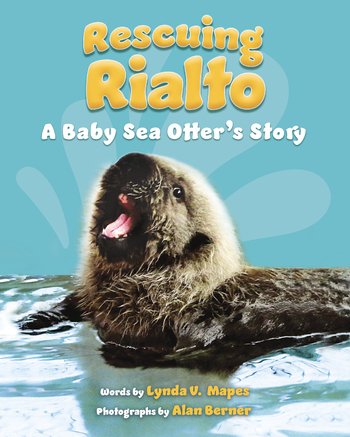 Learn about Rialto's rescue--and how you can help to save this endangered species--in this book by the Seattle Times reporter and photographer who chronicled his story as it happened. Just as he captured them, Rialto's sure to steal your heart, too. Lynda V. Mapes has written countless stories about nature and the environment in her twenty-two years as a newspaper reporter at The Seattle Times. She is also the author of Witness Tree: The Seasons of Change with a Centure-Old Oak. Alan Berner has been a photographer at The Seattle Times for three decades. A native of St. Louis, Alan has degrees in philosophy and photojournalism from the University of Missouri.